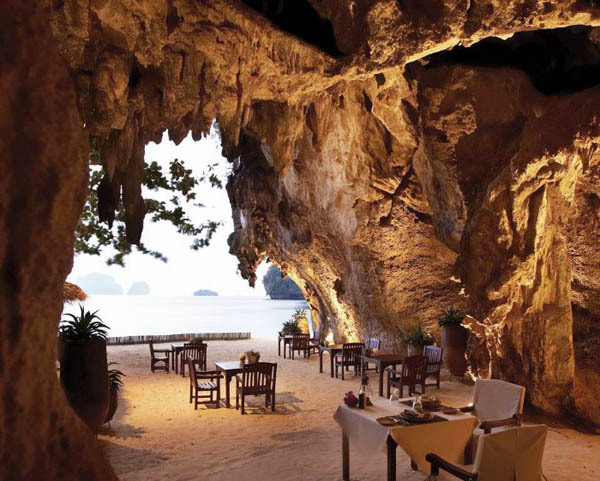 Aptly named, The Grotto nestles under an ancient limestone cliff on the edge of Phranang Beach. Enjoy a leisurely lunch here with your favorite book or lose yourself in the magic of a perfect sunset as you enjoy cocktails and a menu of light snacks with soft sand underfoot and a hint of romance in the air. Sumptuous barbecues are also held here on special nights each week. Rayavadee, Krabi is a unique and luxurious five-star resort situated on southern Thailand’s Andaman coast. Accessible only by sea due to the surrounding limestone cliffs, guests arrive at the resort after a short, exhilarating speedboat trip from Krabi pier.